Teeth are lost for a variety of reasons. When teeth are lost the bone shrinks gradually over time. If the teeth are not replaced the adjacent teeth and opposing teeth slowly shift into that space, changing the “bite”. A dental implant replaces the individual tooth that was lost, prevents most of the shrinkage of the bone, and preserves the alignment of the teeth and the “bite”. Most patients with dental implants forget which tooth is the implant tooth and which is the real tooth. 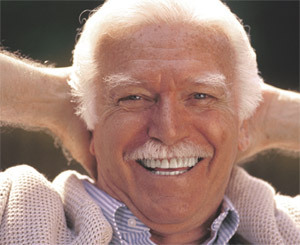 Patients with dental implants can smile and chew with confidence. Are You Ready Reclaim Confidence in Your Smile? Dental implants also help preserve facial structure, preventing bone deterioration that occurs when teeth are missing. Following the loss of a tooth, you do not want to wait too long before you place a dental implant as the bone starts to shrink after a tooth is extracted. Using the most recent advances in dental implant technology, Drs. Blecha and Jandali may be able to extract a tooth, place the implant, and create a temporary tooth on the implant, all in one session. 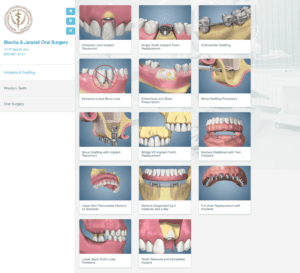 The patient advantage is that we minimize the number of procedures and healing periods. There is still a healing period, and this healing period is very important to the long-term success of the implant. In these cases it is extremely important that the patient not eat on these areas during the entire healing period as eating on the implant area may make the implant fail as well as lose the bone about the implant. Drs. Blecha and Jandali will evaluate each patient individually as every case is not suitable for immediate implant placement. What is most important is that we obtain proper implant healing, even if we have to use several procedures with several healing periods. Dental Implant placement is a team effort between an oral and maxillofacial surgeon and your restorative dentist. While Drs. Blecha and Jandali performs the actual implant surgery, initial tooth extractions, and bone grafting if necessary, the restorative dentist fits and makes the permanent teeth or prosthesis. Either your dentist or Drs. Blecha and Jandali will make any temporary prosthesis needed during the implant process.